Nutrient Film Technique (NFT) involves a very shallow film of nutrient solution constantly flowing over the roots of your plants with the aid of a pump. The pump recirculates the nutrient solution around the system, meaning your plants are constantly bathed in the feed. The Sqaure GroTank system is easy and quick to install. Multiduct accessories for 2 and 3 Channel. 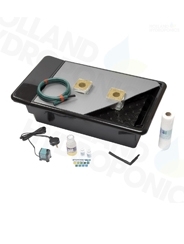 The NFT GroTanks are simple, easy and quick to install. The system works through a pump lifting the nutrient solution from the tank onto the channel where it then flows evenly across the roots of the plant thanks to a spreader mat. A variety of spare parts for your GroTanks. Avoid light entering the root zone in your GroTanks use corriboard. Various sizes and shapes of nutrient reservoir tanks are available. Spreader Mat for even distribution of nutrients within the root zone.